Reptiles and the earliest dinosaurs are known for their scaly skin. They had no fur, no hair, and they certainly didn’t have feathers. Go back about 230 million years, however, and you’ll find a different sort of creature. Using laser-stimulated fluorescence (LSF), a team led by Nanjing University professor Baoyu Jiang — in collaboration with researchers from the University of Hong Kong (HKU) and the Foundation for Scientific Advancement, among others — has discovered that pterosaurs (close relatives of dinosaurs) actually had feathers. This pushes back the origin of feathers by 70 million years, according to the researchers. 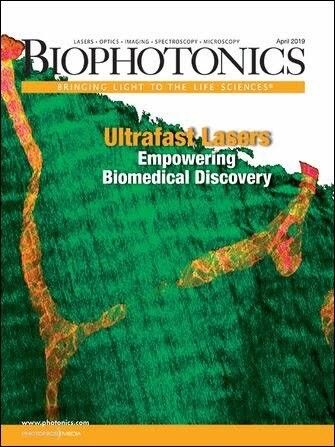 The laser-based imaging technique — developed by Tom Kaye, director of the Foundation for Scientific Advancement, and Michael Pittman, a research professor in the Vertebrate Paleontology Laboratory at HKU — harnesses the intensity of lasers to make a specimen fluoresce. LSF imaging produces colors that don’t specifically identify what scientists are looking at; the fluorescence does identify, however, that something is different in the image. Depiction of a pterosaur, which had four different feather types over its head, neck, body, and wings that would generally have been a ginger-brown color. Courtesy of Yuan Zhang. The research team removed tissue samples from the specimen and collected 10 spectra using an IR microscope. Selected areas with extensive soft tissue preservation were photographed with a microscope that had a digital camera and fluorescence illuminator attached. The specimen was imaged with a 405-nm, 500-mW laser that was projected into a vertical line, which was repeatedly swept over the specimen during the exposure time for each image in a dark room. The images were captured with a digital single-lens reflex (DSLR) camera fitted with a long-pass blocking filter to prevent image saturation by the laser. Laser-stimulated fluorescence (LSF) image of pterosaur specimen NJU-57003 shows extensive soft tissue preservation in black, demonstrating that the feathers were preserved in place. Courtesy of Thomas G. Kaye and Michael Pittman. “The [laser-stimulated fluorescence] images vividly revealed the form of the wing membrane, demonstrating that its generally ginger-colored feathers were preserved in place,” Pittman said. According to the researchers, pterosaurs evolved a furry covering called pycnofiber that was presumed to be fundamentally different from the feathers of birds and other dinosaurs. Now this study, published in Nature Ecology & Evolution (https://doi.org/10.1038/s41559-018-0728-7), has shown that pterosaurs had at least four types of feathers: simple filaments (or hairs), bundles of filaments, filaments with a tuft halfway down, and down feathers. These four feather types are known from two major dinosaur groups — the plant-eating ornithischians and the theropods, which include living birds. Pterosaurs had at least four feather types: filaments, filament bunches, tufted filaments, and down feathers. Scale bars in photos a-d are: 100 μm, 200 μm, 500 μm, and 1 mm. Courtesy of Zixiao Yang. The researchers noted that they were unable to find any anatomical evidence that the four pycnofiber types identified were different from the feathers on dinosaurs, including those of birds. Instead, they found that these must share an evolutionary origin with dinosaurs of around 250 million years ago.